Listed below is a general features list along with vehicle specifications for the Third Generation (1971-1996) General Motors G-Series Vans. 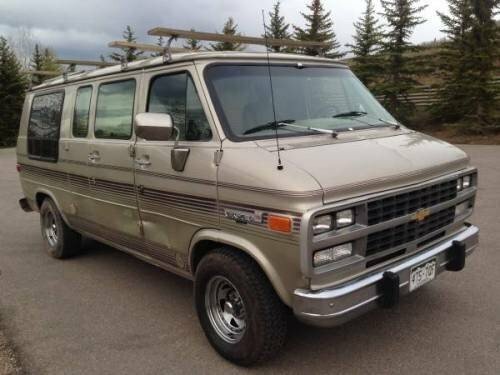 The GMC Vandura version is the primary focus below, however the ChevyVan shares many similarities. For more information check out the Chevrolet Van Wikipedia page. In 1983 a 6.2L Diesel V8 was made available which ran through 1993. In 1994 GM introduced an updated 6.5L diesel which would run through 1995. 1983 marked he apperance of the iconic A-Team van and also the introduction of the 4-Speed Manual 117M transmission. In the previous year (1982), manual transmissions were relocated from the steering column to the floor. The standard 4.1L inline 6 was replaced by a 4.3 L V6 and California emissions laws forced a fuel injection 5.7L V8. All other 49 states carried a carbureted 152 HP version. 1990 marked a differentiation year for GMC by introducing an Extended Wheel Base (EWB) model that llowed from an extra bench seat making a 15 passenger van. This was a differentiating factor from Dodge & Ford who only featured a welded-on body extension. Late in the model generation GMC intrdoucd a longer nose and four head light design. This became more popular with conversion companies, primarily for school buses. GM continued to sell stripped down version for these and other conversion purposes.